So sitting in my room listening to the sounds of Tim Burton's "Sweeney Todd" the doorbell rings, as I hear the running of footsteps from my door. What could it be, who is there... I am alone, or am I? I got box that seem to be moving and moaning, I grabbed the box and went back to only discover my "ZOMBIES" had arrived from the company "Neatorama". 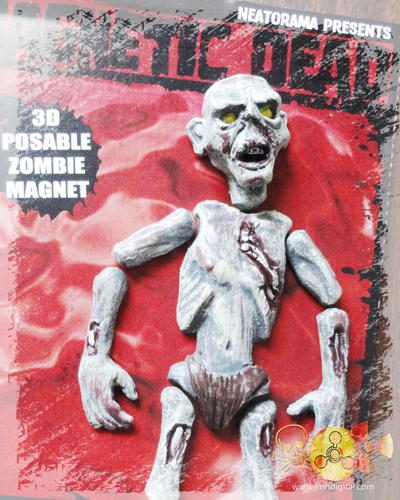 I ordered not to long ago, and here they were my "Door Wedges" and "3D Posable Zombie Magnet", I know I shouldn't have... but who could resist those zombie eyes. I plan I getting more from them, cause not only do they have these... some of the coolest stuff on the planet. You should all take click jump over to "Neatorama" and see if there might be something you would like... I am sure there is, yes I am sure there is. those are awesome...course they would probably scare the crap out of the dogs...or become their next chew toy..love it! I have seen those dead wedges before and they are so cool!! 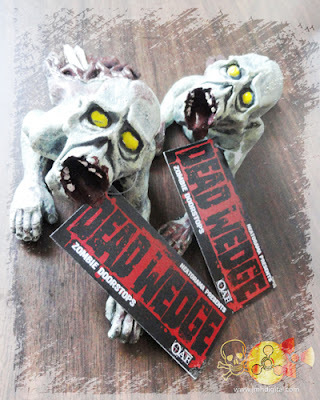 Dead Wedge - I like that! Those are so you, Jeremy. Oh, the magnet and door wedges are fantastic! I'm going to check out Neatorama , now!! Nice pick ups. Checked the sight and they have some very cool stuff. Will scan thoroughly through their items later. Very nice!! I agree, I could not resist either! !